There will be five constitutional amendments placed on the November 2018 ballot. The question, however, is whether or not the votes for all five amendments will be counted. Four of the five constitutional amendments face court challenges. 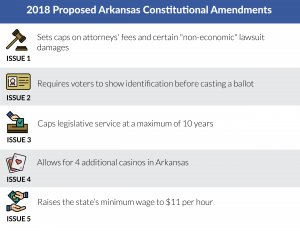 According to Article 5, Section 1 of the Arkansas Constitution, voters may propose statewide or local legislative measures or acts and statewide amendments to the Constitution. This can be done by either an initiated act or constitutional amendment. The Arkansas legislature may also propose amendments to the Constitution. The state legislature is allowed to refer up to three constitutional amendments in each general election. During the 2017 Regular Legislative Session, the legislature referred two constitutional amendments. The following constitutional amendments will be placed on the November 2018 ballot. To date, two specially appointed masters, who oversee and make determinations on the signature gathering process, have submitted reports to the Arkansas Supreme Court. Regarding Issue 1, a Pulaski County circuit judge ruled earlier this month that Issue 1 was an illegal “logrolling” of various subject matters into one ballot measure. The judge’s decision is currently on appeal to the Arkansas Supreme Court. Issue 2 is the only proposed amendment guaranteed to be on the November ballot, which would require voters to show identification before casting a ballot. Governor Asa Hutchinson has appointed a special master to review two lawsuits challenging Issue 4 that would allow for four additional casinos in Arkansas. The special master appointed to review the signature process on Issue 5 reported that the sponsors gathered enough valid signatures and should remain on the ballot. We will continue to monitor the progress of these court challenges. Stay tuned for updates.